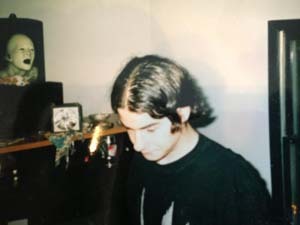 Jack Marchetti is launching a Kickstarter campaign this week for his latest project The Evolution of a Gen-X Music Purchaser. It has been a couple of years since I last interviewed Jack so we had a lot of ground to cover. Join us as we talk about the campaign, movies, music, and some amazing new advances in science. 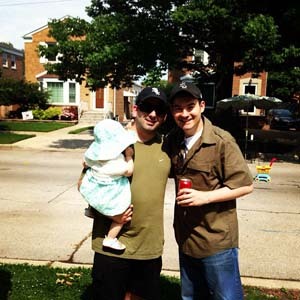 Find out how a blog post led Jack and his brother to a doctor who now offers hope for those who are losing their eyesight due to retinal degeneration. MV: Welcome back to Movie Vine, Jack. A lot has happened in the past couple of years since we last caught up with you. 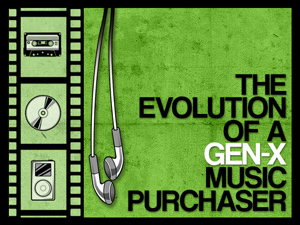 Let’s begin with your latest project The Evolution of a Gen-X Music Purchaser. What can you tell us about the story and character? Jack: Thanks so much for having me back. The Evolution of a Gen-X Music Purchaser (genxmp for short) is a short film which chronicles the life of a single character from the 90s through modern day with milestones in his life tied to the way he was able to consume and purchase music. So it’s almost a biography of a GenXer while also a biography of the changes in the technology of music purchasing. It centers around one main character as he goes from sixteen years old in 1996 while picking up a CD at a local record store, and culminates with him driving to a park to meet his wife and daughter where he purchases a song on his smartphone after identifying the song he was listening to while driving. MV: The idea is based on a blog post which you wrote back in 2010. What are some of the differences between your original idea versus the current script version? 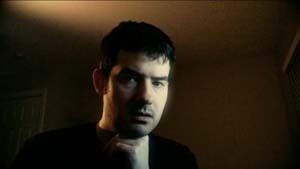 Jack: The blog post was autobiographical in every way. Each scene in that post was something that occurred in my life. The script, while still somewhat autobiographical takes some creative liberties. One of the biggest was having a scene with the characters at Tower Records on September 10th, 2001 when they were going to buy “God Hates Us All”, a new album by Slayer. Yes, ironically, an album called “God Hates Us All” was released on 9/11. Then again, so was “Glitter” by Mariah Carey. While that actually happened, the people in the scene have changed to make it more cinematic. I also changed the ending. The blog post ends with a character downloading an album on his iPad before it veers off into one of my diatribes about whether or not these advancements are a good thing or not. I’ve got some opinions on that which I hope come across in the film and don’t come across as pretentious or preachy. It’s been almost four years since I wrote it, so I wanted to figure out a way to end it tied to the most modern application of music purchasing and I also wanted to finish the “evolution” of the characters life by giving him a family. I have a fiancé but I don’t have kids. MV: I think that’s a great idea! You are working with Kickstarter to raise money for the film. What are a few of your goals for this campaign, and also what are some of the cool pledge packages you are offering to backers? Jack: Well the primary goal is to raise the funds to produce and finish the movie, and to ensure that we make something of a high quality. I don’t know how many attempts I’ll have at the director’s chair so I’d like to create something as great as possible. Not that anyone ever sets out to make crap but if this is the one thing I get to make, ever, then I want it to be incredible. While we offer the typical stuff you find with a movie such as thanks in the credits, streams of the film, posters and t-shirts, the ability to be an extra/on camera, the one reward I’m curious to see how people take advantage of is personalizing the movie. This tackles a few things. We won’t have the time nor budget to clear all the items you might see in a record store (posters, CD art, t-shirts). So if we can attract backers who have their own bands, their own art, their own posters, we can get them to give us clearance and put it in the film and thus personalize it for them. I think that’s a really cool thing. We also are offering for just a few people the ability to take advantage of the campaign’s social reach which would include Facebook posts, Tweets (though we don’t have many twitter followers), and backer updates to promote their campaign. I got the idea from Jeanne Veillette Bowerman. She offered a similar reward during her Impasse Kickstarter campaign. MV: Since the story has a strong foundation in music would you mind talking a little about the process of licensing music for a film especially when you have specific bands in mind? Jack: This was the first rabbit hole I found myself in when I decided to make this project. Music is so integral, that I’m hoping the entire thing plays like a nine minute music video with no dialogue. Currently there’s only voice over, so if I can just visually tell the story with the music soundtrack, that’d be something. Although, I think the voice over adds a lot. We’ll see what happens in the edit. Anyway, so the first big surprise was learning you need two licenses if you want a song on film. In order to have a song play over your motion picture you need a sync license. This is controlled by the publisher of the song. The publisher of the song is someone who represented the writers of the song. Once you secure a sync license, you most likely want to use the song that everyone is familiar with. For that you need the master license. This is almost always controlled by the record label. Something else to keep in mind is that you might catch the publisher or artists on a good day, and they like your project, and they offer you the sync rights for $500 which is about as low as it’s gonna get for a film festival only license. However, if the record label wants to charge you $1,000 for the master use license, you now need to pay the publisher $1000 because MFN (most favored nation) applies. So now you’re spending $2,000 for one song, you will only get to use for one year on the film festival circuit. And if you’ve now set the bar at $1000 per license (they refer to it as a side when you speak to publishers/record labels), any other song you want in your film is going to cost $1000 because MFN applies to all of them as well. It is possible that you’ll get a band that didn’t have MFN in their contract, but I doubt it unless they’re a complete unknown on an indie label or something like that. So the biggest obstacle I came across while budgeting this project was that I have no idea how much I need for music licensing. It could be a couple thousand, it could be ten thousand. Most of that budget I’ll be covering out of my own pocket because it’s such an unknown. MV: So licensing music for a film is a lot more difficult than one would think. In our last interview we discussed the importance music has on your writing process. Which bands wrapped themselves around your keyboard this time? Jack: For this script I created a playlist which I hope to actually use in the film. It includes Slayer, A Tribe Called Quest, Nine Inch Nails, Rage Against the Machine and Suicidal Tendencies. If all those bands agree to let me use their songs at a reasonable price, I’ll be incredibly happy. I don’t know what the odds are on that, but I’m hopeful. You can listen to the playlist here. For just in general, I’ve been listening to Hesitation Marks, the new album by Nine Inch Nails and The Marshall Mathers LP 2 by Eminem. When I was writing a Western with my brother I had Mac Miller on repeat. MV: There are still a lot of older bands whose music is not yet available online. What advice would you give to those musicians who are holding out on releasing their music on a digital platform? Jack: To each their own in my opinion. I know for some bands like Tool, they see their albums as a collective art piece, not individual songs to be broken up. I can respect that. It’s rare to find an album that works only as a full set and not as individual items. That’s the only legitimate reason I can think of. This isn’t 2000. This isn’t Napster. It’s been fourteen years since Metallica made that huge fuss. Get over it and get on board. MV: In addition to The Evolution of a Gen-X Music Purchaser I know you have quite a few projects in the works. What can you tell us about the scripts you wrote with your brother Brian? Jack: My brother and I wrote our first script together two years ago. A little post-apocalypse zombie film called “Host”. I think it’s really good but we didn’t really do much with it. I think we both wanted to see if we could write together. So about a year ago, I was asked by a producer I had worked with before if I was interested in writing something new for them. At first I said no because the material wasn’t anything close to what I consider my wheelhouse. While I had written a Christmas movie before that was optioned, these producers were looking for a family-friendly movie centered around Valentine’s Day. I said no for at least a week. It’d be one thing if they were offering payment up front, but they weren’t which makes it easier to say no. A few days later after I had said no, my brother asked, out of the blue, if anyone ever approached me to write something for them. I told him about the Valentine’s Day producers and he said “Well it’s not like anyone else wants us to write anything.” So we came up with the full idea, wrote a draft and it was optioned relatively quickly. The same producers then asked us to write a Western based upon a very simple idea they had. We ended up flushing that idea out a lot further than what they were comfortable with. I still think the script we gave them was the best thing we had ever written, but it was way too big for what they were looking for. That script is set to be the basis for a much smaller film they’re hoping to shoot this year. MV: So you and Brian have been really busy. I think one of the toughest parts of writing is the waiting. What are the next steps for those projects? Jack: More hurry up and waiting. I can’t get into specifics really, but the Valentine’s Day screenplay seems to have garnered the most attention, and most interest. I try not to get too deep into the world of pre-sales, foreign rights, tax credits, but after seeing how that part functions, I’m amazed any movie ever gets made. And that’s partially why I’m back on Kickstarter. While I’m confident that all those projects will get into production soon, I didn’t want to wait around any longer. I wanted to create my own thing. MV: What are some lessons you have learned in writing over the past couple of years that would have saved you a lot of time and energy had you known them from the beginning? Jack: Idea is king, and producers are moving targets sometimes. I would also mention that if you had told twenty-two year old me, when I purchased Movie Magic Screenwriter for the first time and started my first draft of my first script, that it would be close to twelve years before I saw any sort of success, I would’ve quit right there. I’m glad I didn’t and while that success isn’t there yet, it’s really close. Also, try new genres. I always saw myself writing dark, violent, thrillers similar to Seven and it looks like my first success is going to come for a made for TV family-friendly movie centered around Valentine’s Day. Who woulda thought? MV: Well, Jack, I have saved the best for last. Would you mind sharing your good news with our readers about your recent eye surgeries? Jack: I’ve had cataracts for a number of years and in 2013 it got to the point where they were starting to bother me. My vision in my left eye had deteriorated to 20/70 and my right eye was still holding at around 20/50. I had surgery on my left eye first in March of 2013 and things didn’t go so well at first. I had many side effects that normally take decades to appear and they over corrected me, so I went from being super near sighted to slightly far sighted. I was a bit disappointed. But then I had this procedure called a YAG laser which is used to clear up cloudiness caused by the surgery. Again, this cloudiness appears in patients, but normally ten years after surgery. Mine happened two weeks later. So a few hours after the YAG procedure I was outside and the colors were vivid and crisp. It was like going from standard definition to HD. I just stood in awe and realized how much of the world I had been missing due to the cataract. My vision improved to 20/40 and sometimes 20/30. They waited a year to make sure I didn’t develop any other severe side effects and they performed surgery on my right eye two weeks ago. I have the same side effects on the right eye but at least I know what’s coming. This does not solve the underlying eye disease I have which is Retinitis Pigmentosa. I was actually diagnosed with Cone-Rod Dystrophy as a kid, but my symptoms mimic RP. MV: How has life changed now that you no longer wear glasses and contacts? Jack: It’s weird. I go to bed at night and I can see the TV. I wake up and I can see where I’m walking. I’m still getting used to it. At night I still go to the bathroom to take out my contact lenses which aren’t there anymore. I’ve worn contact lenses for twenty years. It’s different. I still need reading glasses, and will most likely get prescription strength sunglasses to correct some of the farsightedness in my left eye, but I’m really happy with the results. MV: What can you tell us about the upcoming clinical trials that Dr. Henry Klassen will be conducting for a retina regeneration treatment? Jack: Dr. Henry Klassen should carry around a wallet which reads bad motherfu***. He’s on the bleeding edge of stem cell regeneration therapies, specifically for diseases of the retina, which makes him my personal hero. He’s an Associate Professor and Director of the Stem Cell and Retinal Regeneration Program at the University of California Irvine, Ophthalmology School of Medicine. I wrote a blog post a few years back called “Help me Dr. Henry Klassen, you’re my only hope.” It was assigned writing at the agency I work at, and I wrote it mainly to explain to co-workers, who may not have known me that well, that I was visually impaired. A few years later my brother reached out to Dr. Klassen to inquire about any upcoming clinical trials or just to catch up on the where stem cell therapies stood. He responded to my brother quite quickly and then asked “Hey, are you Jack’s brother?” I guess someone on his team had found my article and brought it to his attention. We’ve kept in touch over the past few years and he’s let us know that clinical trials should begin in late 2014 or early 2015. Small world and I’m happy he got the Star Wars reference in the blog post title. MV: That’s so exciting! I am beyond thrilled for both you and your brother. Last question, you mention in your campaign video the line from Eminem’s song Cinderella Man “music is my time machine”. That is a brilliant way to look back on your character’s story and also a great way to look forward in your life. What song resonates with you now that when you look back in five or ten years it will be the time machine to where you are today? Jack: That’s an awesome question. For this particular time, say the last eight months, it will definitely include Copy of A by Nine Inch Nails. I’m a huge NIN fan, obviously and I played the hell out of that song over the past several months. I even went to Las Vegas in November to see them. I was out there for an Amazon Web Services conference for work and they just so happened to be playing at the Hard Rock. MV: That’s a cool song. Thank you so much for hanging out with Movie Vine today, Jack. I really appreciate your openness and candid sharing of every part of your life with us. I know our readers are celebrating with you, and are looking forward to being a part of The Evolution of a Gen-X Music Purchaser. Jack: Thank you so much for having me again. I’ve had the idea of doing this project in my head for over a year. If you check the creation date on the Facebook page you’ll see it was created 3/11/13. I’m incredibly eager to find out if other people are as excited about this project as I am. *Be sure to check out The Evolution of a Gen-X Music Purchaser Kickstarter here. Follow Jack on Twitter and genxmp on FB. Comments for Milestones with Jack Marchetti are now closed.